This printed version of Reeder's address included a review of how the land that became Kansas was acquired by the United States and of various legislation and treaties that applied before the passage of the Kansas Nebraska Act. 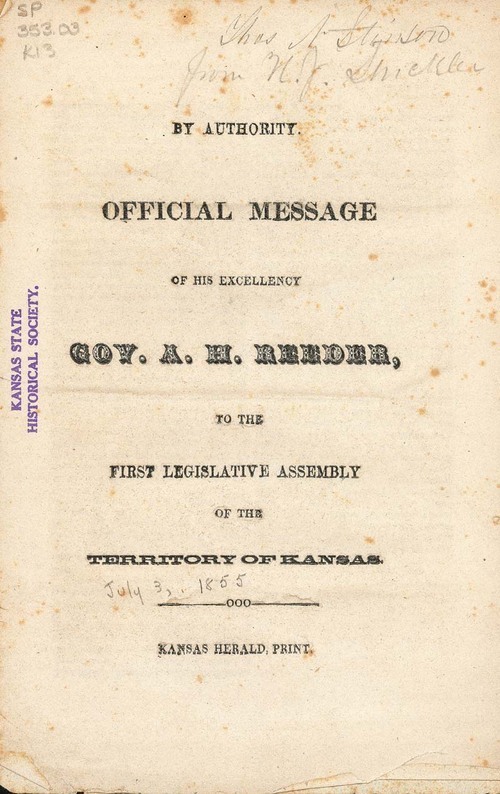 Reeder also identified some of the responsibilities of the Legislature including establising a means of determining if Kansas was to be slave or free, establishing counties, setting up a judicial system, levying taxes, organizing a militia, determining a permanent seat of government, and creating a constitution. He also included some statistics from the first official census, which recorded 2,904 qualified voters out of 8,521 residents (only free males could vote). Reeder indicated the need to resolve the issue of selling intoxicating liquors to Native Americans. By Authority. Official Message of His Excellency Gov. A. H. Reeder, to the First Legislative Assembly of the Territory of Kansas.